* Courgette is the British term for Zucchini also commonly called Italian squash. For the potatoes bring the chicken stock to a boil and infuse with thyme, rosemary and crushed garlic cloves. Strain before use. Gently sauté the onions and garlic in olive oil until softened and lightly colored. Rub an oven proof dish with olive oil and layer the onions followed by the potatoes, repeating until the dish is full finishing with a final layer of potato. Make sure to season each layer as you go. Pour over the stock until it comes 2/3rds of the way up the dish. Press down on the mixture to help the liquid absorb and finally drizzle a little olive oil on top. Bake in the oven at 200c for approximately 20 - 25 minutes or until soft and golden on top. Next, season the lamb and seal in hot olive oil. Bake in the oven at 200c for 7 to 8 minutes. Meanwhile, in a blender, thoroughly mix all the herb crust ingredients together, season and set aside. Remove the lamb from the oven and brush with the mustard before dipping into the herb crust mix covering the fat thoroughly. Allow to rest and before serving simply return the lamb to the oven for a further 2-3 minutes. For the vegetables, sauté the courgettes and rosemary in olive oil, season and add a dash of vinegar. Add the tomatoes, basil and coriander and cook for approximately 5 minutes further seasoning with a little more oil and vinegar. Allow to cook until the vegetables have just begun to soften. Slice the lamb into 3 chops per person, serve with the courgettes and a generous helping of the potatoes before spooning over a little of the vinaigrette from the vegetables. 1. Pre-heat the oven to 200C/ gas mark 6. 2. Heat some oil in a large pan and quickly fry the seasoned beef all over until it's brown. Remove and allow to cool. The point of this is simply to sear the beef and seal all those juices in, you don't want to cook the meat at this stage. Allow to cool and brush generously with the mustard. 3. Roughly chop the mushrooms and blend in a food processor to form a puree. Scrape the mixture into a hot, dry pan and allow the water to evaporate. When sufficiently dry (the mixture should be sticking together easily), set aside and cool. 4. Roll out a generous length of cling film, lay out the four slices of Parma ham, each one slightly overlapping the last. With a pallet knife spread the mushroom mixture evenly over the ham. 5. Place the beef fillet in the middle and keeping a tight hold of the cling film from the outside edge, neatly roll the parma ham and mushrooms over the beef into a tight barrel shape. Twist the ends to secure the clingfilm. Refrigerate for 10 -15 minutes, this allows the Wellington to set and helps keep the shape. 6. 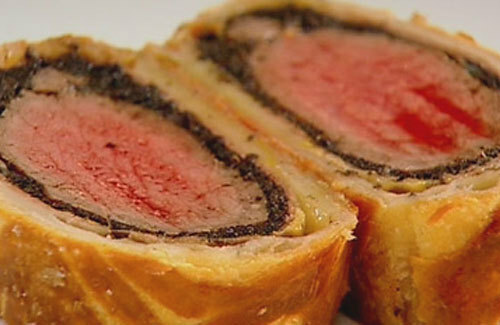 Roll out the pastry quite thinly to a size which will cover your beef. Unwrap the meat from the cling film. Egg wash the edge of the pastry and place the beef in the middle. Roll up the pastry, cut any excess off the ends and fold neatly to the 'underside'. Turnover and egg wash over the top. Chill again to let the pastry cool, approximately 5 minutes. Egg wash again before baking at 200c for 35 - 40 minutes. Rest 8 -10 minutes before slicing. 7. Par boil the potatoes in salted water. Quarter them and leave the skin on. Sauté in olive oil and butter with the garlic and thyme, until browned and cooked through. Season. Remove the thyme and garlic before serving. 8. Separate the outside leaves of the baby gem (leaving the smaller inner ones for salads) and very quickly sauté them in a pan of olive oil with a little salt and pepper - just enough to wilt them. 9. Serve hearty slices of the Wellington alongside the sautéed potatoes and wilted baby gems. A classic mustard vinaigrette makes a great dressing. You can whisk this by hand, but it will take quite an effort, use a food processor if you have one. Put the egg yolks in a food processor with the dijon mustard. and turn the food processor on. The first 30 seconds of making mayonnaise is the most crucial, so be careful during this period and go slow with the oil. SLOWLY begin pouring the oil into the food processor while it’s on. After 30 seconds or so you can start pouring faster. Turn off the food processor when you’ve added all the oil. Add the salt and pepper, then cut the lemon in half and squeeze the juice into the mayonnaise mixture. Give the mix a quick burst with the food processor and done! Store the mayonnaise in the fridge.